I started eating Tofu when I moved into Singapore. How I started is a story. When I moved in, (Seems very long) I had one neighbor who was born and brought up in Singapore. He helped me to get used to the local Singapore Market. So we used to go for the vegetable marketing at the wet market. And she used to buy a lot of Tofu base stuff and of course she got really surprised that I don't eat meat or Egg. She repeatedly asked me not even one meal or not even few days in a week etc.. After that she told me Tofu is good for health esp for Vegetarian. Since I didn't even know what it was I never bought it for almost 2-3 years. After I started working, when we go out with colleagues if I am there they accommodate my dietary requirement most cases. Almost 6 month later they asked me whether I have tried any Chinesse vegetarian dishes like mock meat and Tofu etc.. I told them no. So they brought me to chinese restaurant and when the dish arrived I felt my heart beat. The first dish I tried was Crispy tofu coated with Cornflakes. I kind of liked it. So from there onwards I started to include tofu as part of diet once kids started going to school .Tofu became regular at our house hold. 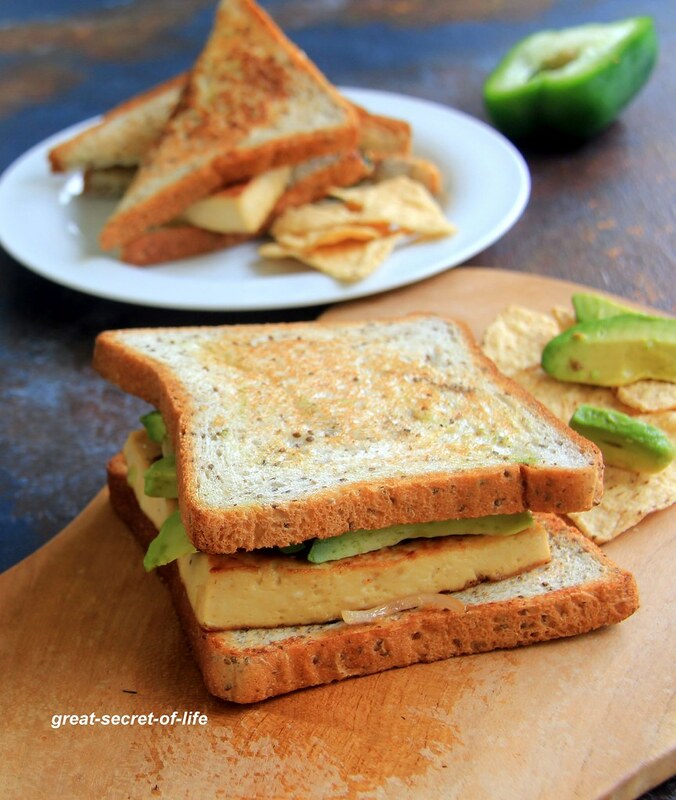 I have been doing this tofu sandwich all the time but most of the time during week days. I wanted to do a blog post on this all the time. Never got a chance. I had a few days off this week and I was at home so I decided to have a good brunch so I had this Sandwich as I had all the ingredients. 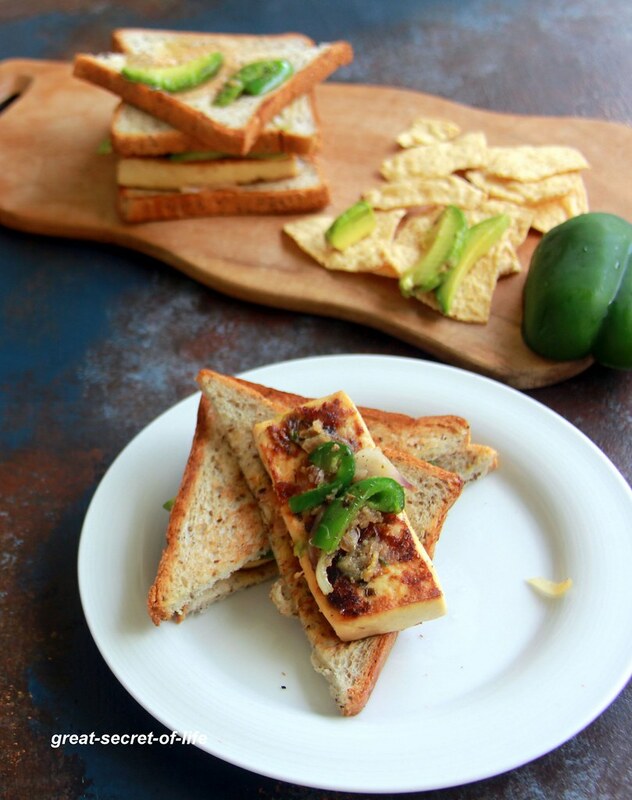 Slice tofu in a slightly thin square or your preferred shapes. Mix together all the ingredients under for Marination section in a bowl. Mix well. place Tofu carefully and roll it in the marination mixture. Remove it and place in a plate. Add Onion and mix well. Add Capsicum and mix well too. Let the vegetables and Tofu marinate for at least 1 hr. Remove onion. Add Capsicum and fry till it is cooked (Don't over cook). 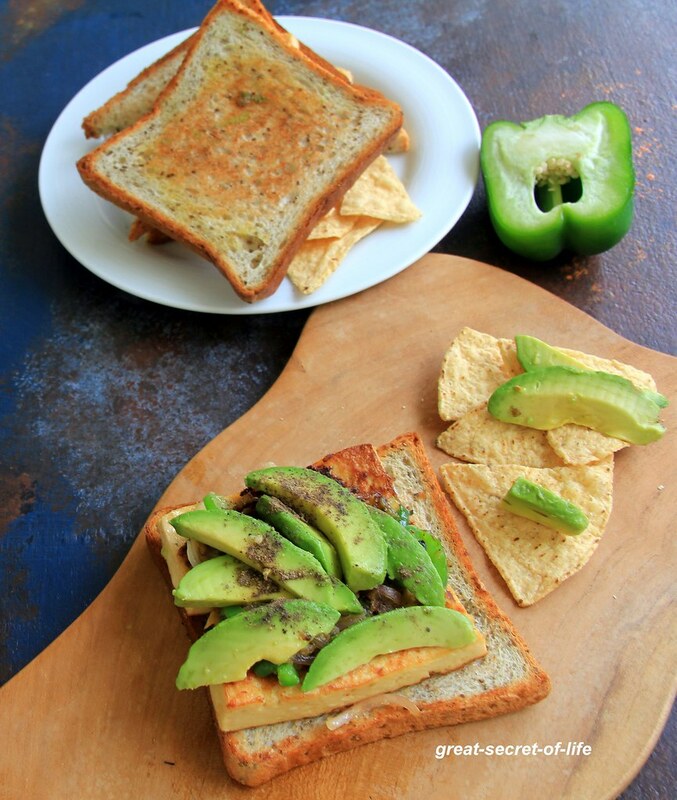 yummy, filling and healthy sandwich! !